Client: University of Northern British Columbia Reference: Tom Berekoff, former Executive Director of Advancement, T: 780-554- 2359, E: tberekoff@whytpb.com Completed: 2007 The UNBC Sports Complex is an example where the project partners, The City of Prince George and the University of Northern British Columbia had many user requirements to consider. 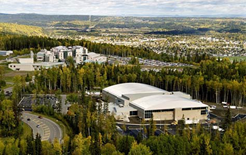 This resulted in a building with a triple gymnasium, a full sized indoor soccer facility, 400m running track, squash courts, cross country skiing training facilities, sports medicine facilities, and all ancillary team dressing rooms and support spaces. 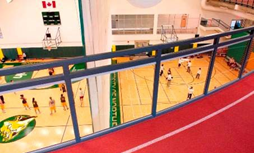 The facility was designed using the most cost effective long span structures to provide the large open spaces for the gym and soccer field with the suspended track, but also incorporated attractive gathering spaces with exposed wood structures and multi-purpose spaces which accommodated both the University and City’s needs and requirements. The layout of the building was also conceived to permit the addition of one or two ice rinks if required at a future date.